At the end of every day you need to be able to answer three questions: How much did I sell? How was I paid? and What did I sell? Being able to answer these questions accurately on a daily basis is the beggining of having control over your retail enterprise. XpertMart™'s POS reports give you the tools to answer these questions. The POS reports covered in this chapter can all be found in the Reports>Documents>Invoice Menu or in the Employees>Cashiers Menu. XpertMart™'s reports, however, are only one half of the solution. The other half is the store policies and management enforcement of these policies. If either of these two halves are missing you do not effectively have control over your money or merchandise. The question of whether your employees are trustworthy or not is really irrelevant. Human psychology dictates that while a small minority of people will always be honest and another small minority will always be dishonest, the large majority of people react to their environment: if the temptation to steal is there long enough, many of them will seize it. Not having effective controls in place at your store is a lot like a stranger accidentally leaving his wallet on your store counter. When you first notice the wallet you are confident you will return it intact to the owner. In fact, you don't even open it. But days later when the stranger hasn't returned for his wallet, curiousity gets the best of you and you peak inside and find hundreds of dollars. But of course you don't take the money: you are honest. Weeks go by and the wallet is still sitting in the drawer waiting to be reclaimed. One day you are a little short of cash and decide to dip into the wallet to borrow $5 dollars. You tell yourself it's ok because you write it down so that, if--no, when--the stranger returns you will return all of his money. As time goes by you find youself dipping into the wallet a second, third, fourth time until you lose count and even stop writing down the amounts you have "borrowed." The stranger hasn't been back to the store in what seem like months now, so obviously he can't be too concerned about his money, right? You still plan on paying back the amount you borrowed, you tell yourself. But if he isn't responsible enough to keep track of his wallet, well you can't exactly be responsible for his money. And then one day out of the blue the stranger returns to the store and asks for his wallet back and the $738 dollars inside. Next thing you know you are being called a thief and and are accused of stealing other people's money. Guess what? If you own a retail store, you are the stranger in this story. And what's even more disturbing is: it can be argued that the stranger is as much to blame as the hapless employee and erstwhile thief in the story. Failure to setup proper controls in your store is unfair to the employee that finally succumbs to temptation and is unfair to the employees that don't but will suddenly be cast in doubt when you realize you are losing money. If you have sloppy controls in your store, if you are not tracking exactly how much money is flowing in and how much merchandise is flowing out...you might as well leave your wallet on the counter every night when you go home. Employees sit in your store eight hours a day everyday. Very little of this time is actually spent helping a customer or ringing up a sale. The rest of the time they are just...observing. Employees know if you have control over your store or not. 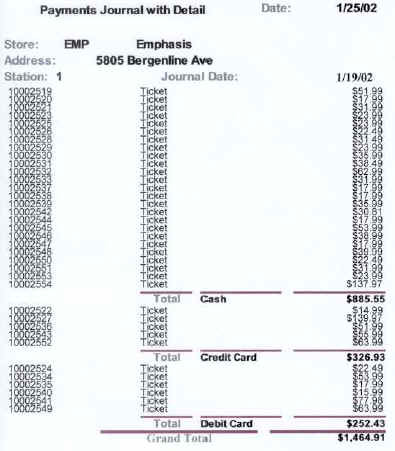 One customer of ours who bought XpertMart™ said he didn't care if the software actually tracked his money and inventory, he just wanted it to appear that he did so that his employees wouldn't get any funny ideas. While we do, of course, stress the fact that if you use XpertMart™ you will in fact have control over your store, his point is still valid: the message you send your employees that you are tracking every change to your inventory is just as important. So if good software isn't enough, what do you need to do to ensure a basic level of control in your store? Perhaps the single most important policy you can implement is to put a large sign in front of the point of sale station that says "Your Purchase Is Free If You Don't Get a Receipt" and tell your cashiers that if any customer comes forward and says they didn't get a receipt for their sale you are docking their pay to pay for the merchandise the customer is getting for free. You only need to enforce this policy once to make sure all sales are being put into the system. And if all sales are being put into the system you've already won 90% of the battle because, as our Philosophy of Control section explained, once information goes into the system it's not coming -- at least not without leaving an audit trail behind. The majority of incidents of fraud and employee theft occur when employees can ring-up sales without recording them in the software. This allows them to pocket the money and then later enter whatever information they want into the system that will cover their tracks. But if you require them to issue a receipt and give your customers the right incentive (i.e. a free purchase) every one of your customers will be fact-checking the cashier and looking after your money. Use 2-ply ticket paper so you can keep a copy of every receipt. Cross-check these receipts with the Merchandise Journal to make sure that what the system says you sold matches what your receipts say. Keep a standard amount of money in your cash drawer and a standard number of bills and coins in every denomination (e.g. 30 $20 bills, 30 $10 bills, etc). Have the store supervisor count the money in the cash drawer every night and sign a log book testifying that the money is all there and take responsibility if it is not. Have the store supervisor the following morning do the same. The cash you receive every day should be deposited the following day in the bank. The store supervisor should staple the deposit slip to the Payments Journal from the previous day. 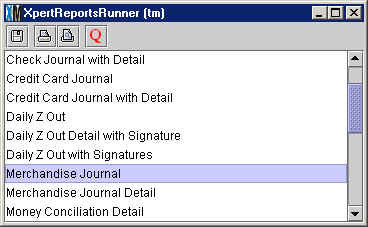 The cash component of the Payments Journal should be exactly the same amount that was deposited to the bank. Make sure the Credit Card Journal matches the end of day report issued by your credit card processing company. These basic steps will give you a high degree of control over the money flowing out of your store. If you periodically conduct Physical Inventories and follow-up any questionable discrepancies by studying the entries in your Audit Log you will also have a high degree of control of the merchandise flowing out of your store. The Sales Journal report shows you for a given day, store and station all of the sales organized by Invoice Type. This report will give you a high level view of what was sold that day. 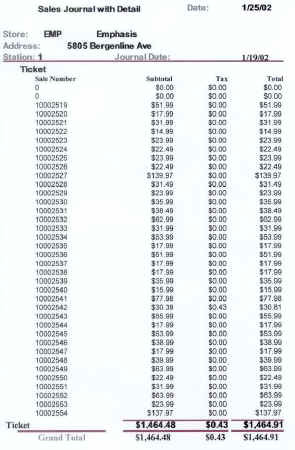 The first column on the left has the Invoice number of every transaction. If you are interestd in investigating further, you can open the Documents>Invoices Catalog and see all of the details behind the transaction. The Sales Journal report also breaks out the tax that was collected that day. Note that any negative number indicates a return and any 0 in the Sale Number column indicates that a transaction was cancelled (without pressing <F2> to exit). You can also run the Daily Z-Out report instead of the Sales Journal as it has the same information but in a slightly different format. The Payments Journal report shows you how you were paid for the Invoices reported in the Sales Journal report. (Notice that the total of these two reports and indeed of any POS report for the same date will match). The Payments Journal with Detail breaks out every Invoice by Payment Type. Once again the Invoice number appears in the first column on the left in case you need to investigate further in the Documents>Invoices Catalog. For every payment type there is a corresponding journal report providing further detail. 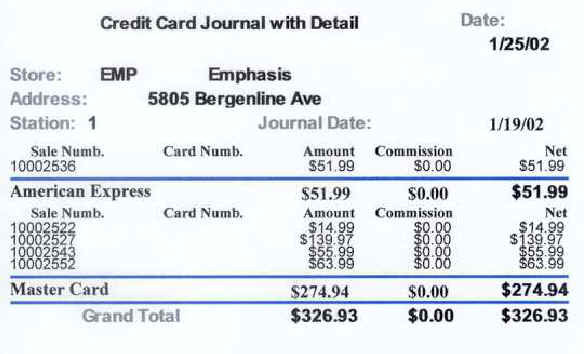 For example, the Credit Cards Journal breaks out the total paid by credit card by credit card type. Similarly, the Checks Journal breaks out the transactions paid by check by the bank that was used. If you filled-in the Commission field in the Credit Card Catalog with the percentage commission each credit card issuer charges you to process the transaction you would also see the net amount you can expect to be deposited into your bank account. 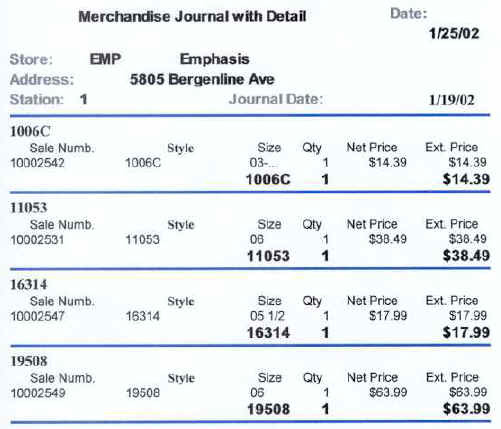 The Merchandise Journal shows you, grouped by Style, all of the Items that were sold on a particular date. The Merchandise Journal with Detail report includes the Invoice number in case you need to examine a specific transaction further. 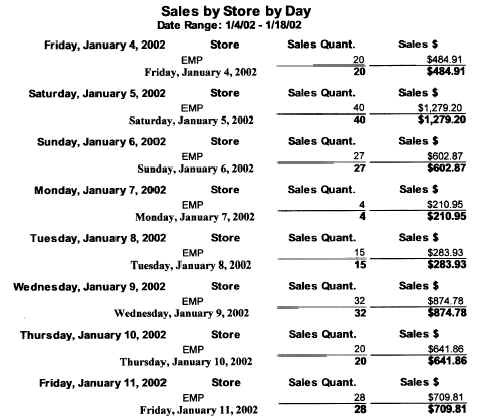 If you want to see your sales for more than one day you can run the Sales by Day report for the date range of your choice.